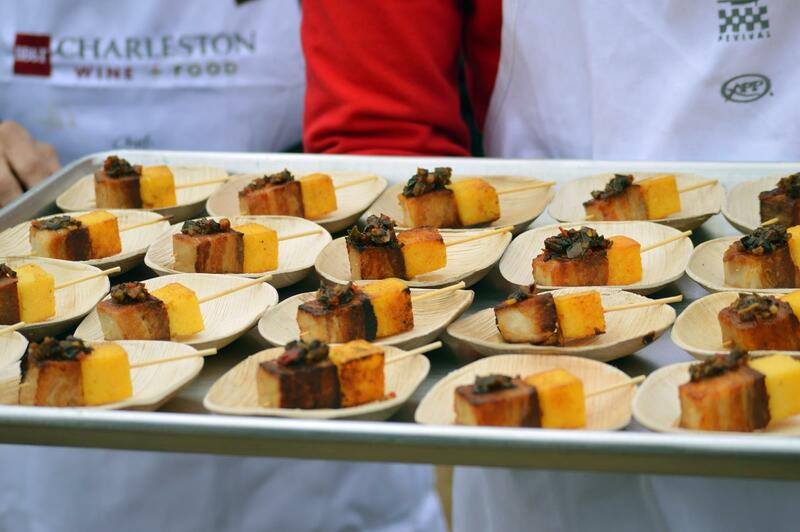 Guests of the Charleston Wine and Food Festival in Charleston,SC enjoyed this favorite from Chef Quagliata. Chef Carmen Quagliata happily took questions and gave cooking tips to guests enjoying the 2015 Charleston Wine and Food festival. Carmen Quagliata and his team work together at the evo grill. When you are grilling with Carmen Quagliata, you are in very capable hands. He is the Executive Chef and a partner at New York’s well loved Union Square Café . For almost 30 years, Union Square Café has been an fixture of New York’s constantly evovling dining scene. Opening its doors in 1985, the restaurant has won five James Beard Awards ( including Best Restaurant in America) and has consistently earned top Zagat’s rankings as one of diners favorite destinations. Under Carmen Quagliata , the restaurant has regained its place at the very top position of Zagat’s list, becoming ‘New York’s Most Popular Restaurant’. There are a lot of solid reasons this place is so respected by its peers and beloved by its guests. If you have the chance to dine with them, you will discover quickly for yourself why they consistently remain on top. 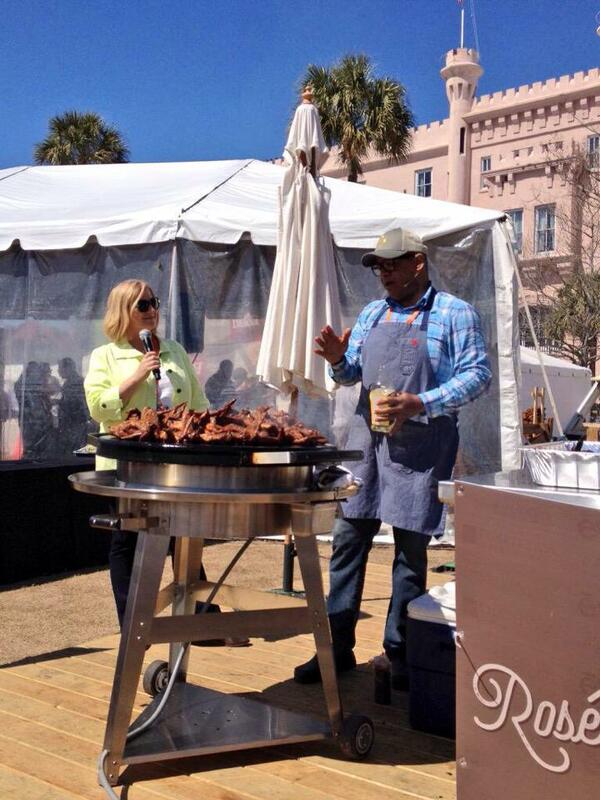 We had the great pleasure of talking and grilling on the Evo with Carmen recently at the Charleston Wine + Food Festival. Skewers served hot off the evo grill. Chef Quagliata’s career has taken him from Napa, CA to Lidia Bastianich’s Felidia in Manhattan in, NY. But he seems to have found a home in NY’s beloved Union Square Café . Carmen’s culinary style was formed early by his Sicilian roots and the grandmothers who made pasta, sausage, and bread old world style. With the Union Square Greenmarket at their doorstep, the Union Square Café has been doing “farm to table” way before the current trend. And let’s face it, although popular in the US right now, the Italians have never stopped practicing a farm to table seasonal mentality. 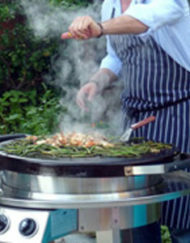 Chef Quagliata is well qualified to marry what is new with the best of what we love about old world traditions in food. His food seems both approachable and fresh simultaneously. And this particular dish truly illustrates his grasp of what a perfect balance of flavor and texture can do to elevate a dish. You can see what I mean by grilling up some of these amazing skewers at home. They make a perfect tapa style appetizer or with a salad would be a lovely lunch or light dinner. Personally, I would have been very happy to eat enough of these to make a large dinner out of them alone. They are a perfect balance of savory and sweet, spicy and creamy, salty and crispy. Most people who tried them at the Charleston Wine + Food festival proclaimed them the top thing they tried all day. 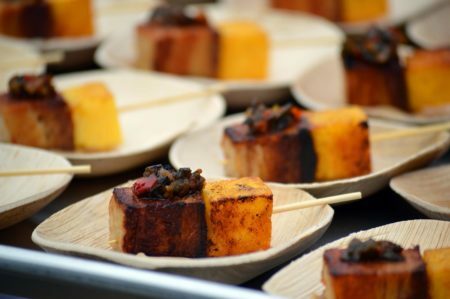 In a sea of top chefs who are all offering amazing bites, this is very high praise. So, for my first post Festival Post, I decided to show you the demonstration photos and an idea of how to recreate your own version at home. 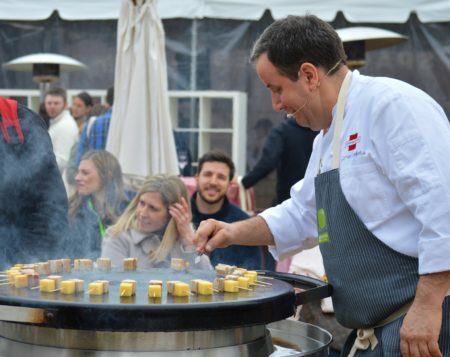 The festival chefs didn’t provide recipes with their samples (unfortunately). So this is a dish inspired by Carmen Quagliatta’s, but is not his original. The relish is his but I believe the relish he served at the festival had more peppers and less onion. I have noted that as an option in the recipe area. As far as tasting Carmen Quagliata’s original recipes goes , let me know if you’ve been lucky enough to dine at Union Square Café! And what was your favorite dish there ? For those not so fortunate, I recommend The Union Square Café Cookbook. It is available on Amazon and provides 160 café favorite recipes to make at home. Planning a visit to the Union Street Café? Note that it does appear that USC is looking for a new home location for their iconic NY eatery. After 30 years, we look forward to the seeing where they land next! This is a perfect “do ahead” recipe. A lot of time goes into the prepping of this recipe, but the final result is well worth the wait. It will also be a seeminglingly effortless dish to those gathered around watching. I love recipes like this because all my sweating is done days before my actual dinner. I then enjoy the meal with the rest of my guests. Plan accordingly! Cover pork tightly and braise in 250 degree oven with all ingredients for 3 1/2 -4 hours or until tender. Remove from liquid and wrap in several layers of plastic wrap then foil. Chill overnight under a weighted sheetpan. Large tomato cans work well for this. This amazing relish is a great accompaniment to the polenta skewers. But it also is terrific with grilled seafood or meat. I would make extra and store for another meal. Don’t be put off by the anchovies- remember that the ever popular Caesar salad is based on that same salty deep flavor, and even your kids eat that! Brush an 8-inch square baking dish with olive oil and set it aside. Place the polenta and water in a heavy-bottomed 2½-quart saucepan and stir to combine. Over medium-high heat and bring to a simmer, stirring constantly with a wooden spoon about 6 to 8 minutes. Reduce the heat to low and cook, stirring frequently. When the grains are soft and hold their shape on a spoon (about 1 hour) whisk in the salt, pepper, butter, and Parmesan. 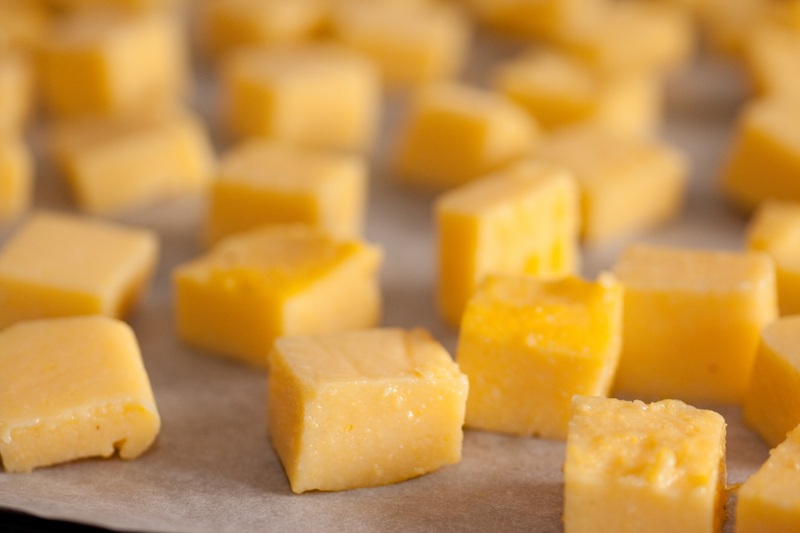 Chilled polenta cubes easily. Plain dental floss can be helpful in cutting. Using a wide offset spatula, carefully remove the polenta from the baking dish and transfer it to a cutting board. Cut the polenta into 1 inch cube pieces. Ready to Skewer and get Grilling! So the hard work is behind you. You’ve probably had several meals from your efforts, something like a delicious noodle lunch, a piece of fish grilled and served with Carmen’s relish and maybe a warm bowl of polenta with dinner. You simply take your chilled prepped polenta cubes and marry them with a similar sized cube of braised pork belly on a wooden skewer that has been soaked. You can do all the skewers well before dinner time as well and store in your frig covered. When you are ready to grill, brush with olive oil, salt, and pepper then put on medium heat on evo grill. You can use a grated grill but you will have seared lines instead of all over searing. Likewise you could place cast iron onto traditional grill and sear or on stove top. I think this is an example of where Evo Grills just beat all the alternatives even though it is possible to make this recipe with different equipment. 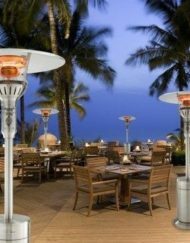 [If your interested in getting one for your self we do have the best selection for purchase right here at outdoorLUX.com. ] Turn skewers three times, grilling until brown on all surfaces ( on evo set on medium heat this will take about 2 minutes a side). Serve with a small spoon of Barcaoilo relish atop or serve with relish alongside. 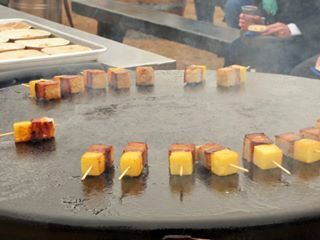 Guests can help themselves right off the evo or grill if using as a party finger food. As an entrée, I suggest a plate of baby arugula and pearl tomatoes simply dressed as a bed for 3 skewers. Note: Chef Quagliata also added a small dollop of apple puree to the base of the dish. This did add another layer of sweetness and additional textural complexity to the dish. Feel free to try adding or omit if you wish. I often streamline recipes a bit at home based what a professional team chooses. 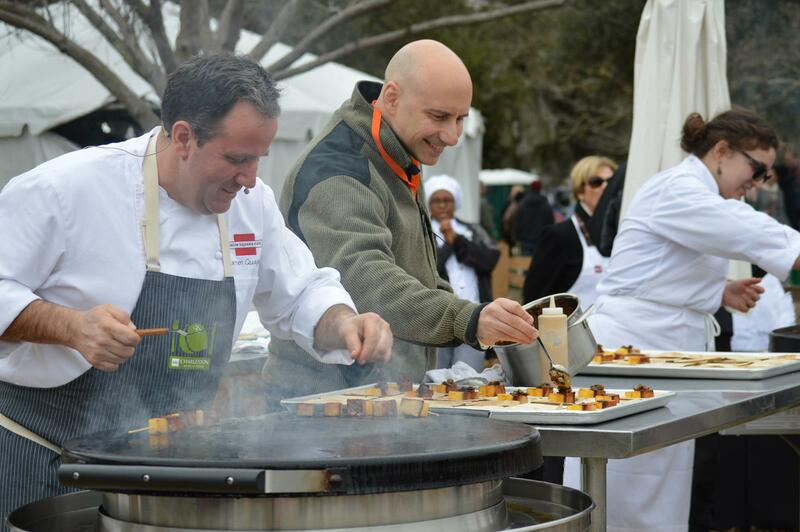 I hope you’ve enjoyed a peak into one of our Charleston Wine and Food Grilling area demonstrations. The event really is one of the finest of it’s kind anywhere. In fact, Forbes has ranked in the top five wine festivals in the united states. So clearly I am not alone in my opinion. The high caliber chefs and events of large festival but with less crowds and more up close time with the chefs. 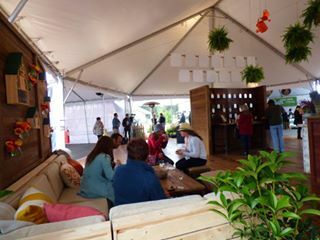 Guests enjoying a break with a glass of wine inside Third Space area. 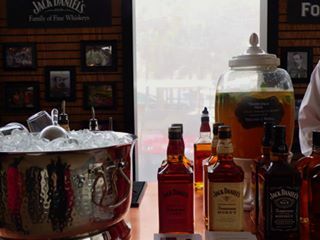 Wine isn’t the only beverage option in the Culinary Village. Craft beer, cocktails, and artisan sodas abound. 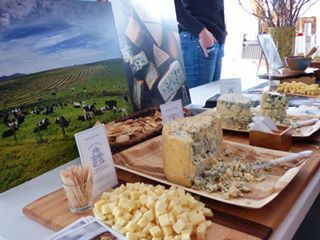 Cheese and wine are a perfect pair found inside Grand Tasting Tent. And Charleston, SC is ranked by Conde Nast as the number one city in America to visit (again!) this year. So next year, come and see for yourself what you have been missing! My advice is to treat yourself to a Culinary Village ticket in 2016. I think it represents the festival’s best value. 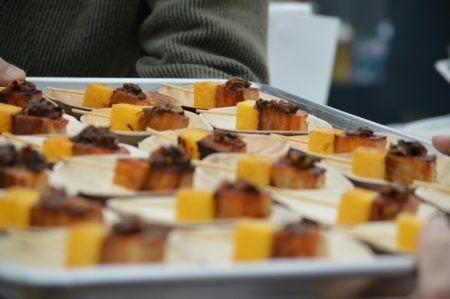 And it is a great way to get largest sampling of the festival and its chefs. 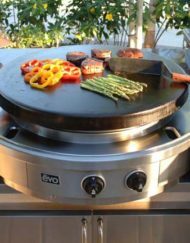 When you come, don’t forget to spend some time our Grilling area to say hi to catch a couple of our fantastic Evo Grill demos! See you there! Guests in the Grilling Area get up close question and answer time with chefs and enjoy served plated samples in a bistro setting. 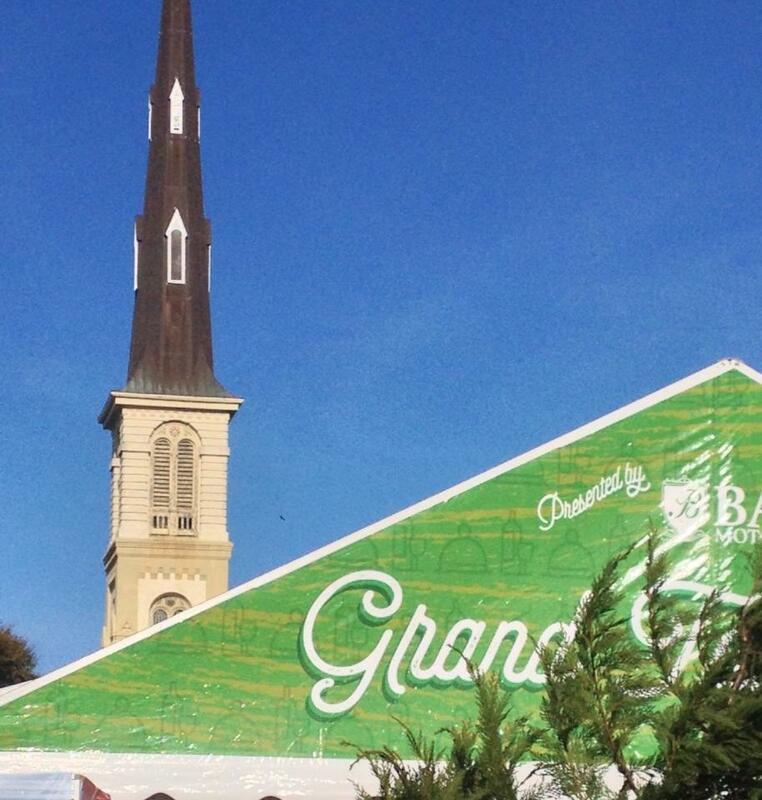 Beautiiful Marion Square is the home of the CHSWFF Culinary Village. 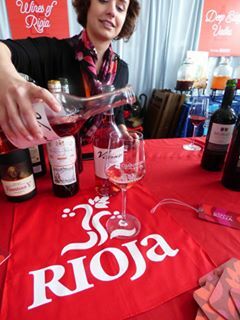 Wineries from around the globe pour tastes in the Culinary Village. Really enjoyed this segment of the cooking demo at the Wine and Food Festival. The Chef was did so much interaction with the crowd. I thought Chef Carmen was really engaging as well. It is one of my favorite things about the Charleston Wine and Food Festival, the chance to really get up close with so many talented chefs. Glad you got to enjoy the festival with us!